Corticelli, once upon a time, was The premier silk thread company. Corticelli silk was known around the world, and even now – though the company no longer exists – their threads are still well known by name. The Corticelli silk company has an interesting history, which began in Florence, Massachusetts, in 1838, in an area where folks had been dabbling in sericulture and silk manufacturing for many years. In 1846, one Samuel Hill took over the company, which was at that time the Nonotuck Silk Company, and under him, the company grew, especially due to his invention of a machine that produced the first successfully-made silk thread for sewing machines. The Singer company jumped on the thread, and the Nonotuck Silk Company really took off. It was around this time, too, that the actual silk production shifted to China and Japan, because the US workforce could not affordably produce the amount of silk needed for the growth of the company. The raw silk was imported from Asia and then finished (dyed, twisted, spun, woven, etc.) in the mills in the US. 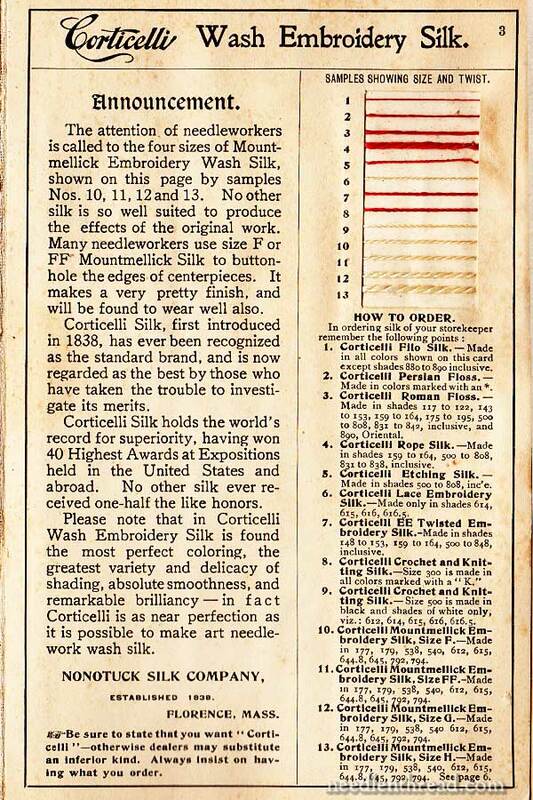 In the mid-1850’s, the name “Corticelli” was applied to some of the silk products produced by the Nonotuck Silk Company, probably as a marketing ploy, since Italy was the popular center of the silk industry at that time. 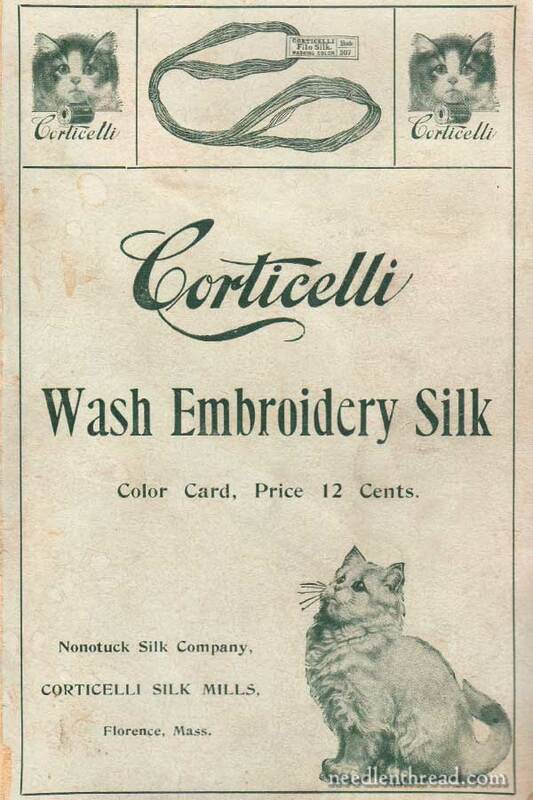 Eventually, in the early 1920’s, the company’s name was changed from the Nonotuck Silk Company to the Corticelli Silk Company. A couple year’s later, Corticelli and the Brainerd & Armstrong silk company (out of Connecticut) merged. In the meantime, Belding Brothers (who began manufacturing silk in Belding, Michigan, in 1860) merged with the Heminway silk company in 1925, and began doing business as Belding-Heminway. Shortly thereafter, Corticelli acquired Belding-Heminway, and thereafter, Belding-Heminway did business as Belding-Heminway-Corticelli, making Corticelli the largest silk company in the States. Corticelli went out of business in 1930, and Belding-Heminway closed their last mill in Michigan in 1932. 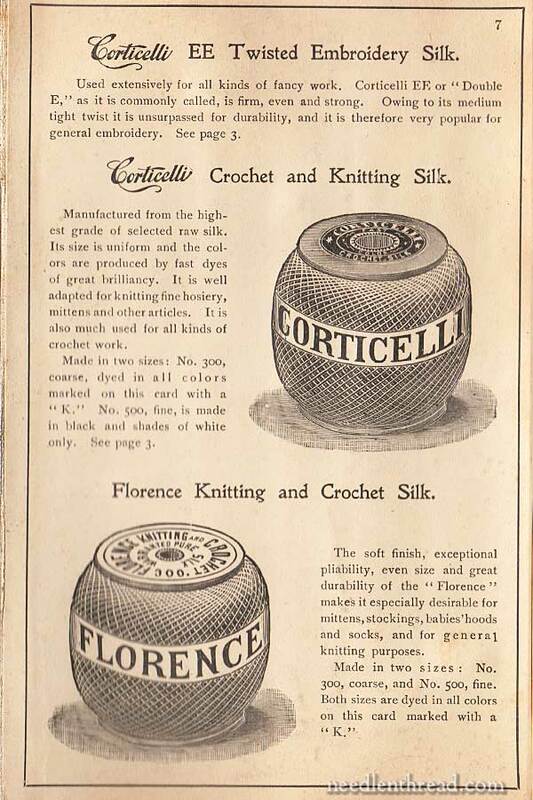 For embroiderers, Corticelli produced a number of threads, from a very fine filo floss to their heavy rope silk. And while you can still find vintage skeins of these silks available through outlets like eBay (sometimes ridiculously highly priced, and sometimes for a steal), it’s very rare to find collections of vintage Corticelli embroidery silk that encompass all their sizes, let alone all their colors. So it is difficult to know what colors of silk and sizes of silk Corticelli produced. Enter, the color card, with real thread samples on it. Real thread color cards are such a good idea. There are some thread manufacturers that still offer color cards with real threads on them, and if you have a favorite line of thread that you use often, it’s always a good idea to find out if the manufacturer sells a real thread color card. They make a great reference tool when planning projects. This particular Corticelli color card is admittedly a favorite of mine. I’ve scanned it so that you can see what the Corticelli company included on their real thread color cards. There’s no date on this color card, but I know it is pre-1922, because it still includes the Nonotuck Silk Company name on it. The front and back cover feature the Corticelli kitten, so the card could date to 1910 or perhaps slightly earlier. The Corticelli Kitten logo first showed up popularly in advertising in 1910, dominating 42nd Street and Broadway in NYC – one of the earliest advertisements on “The Great White Way” – until 1913. Page 2 (the inside cover of the card) features a list of flowers, accompanied by the thread numbers of Corticelli silk that would work well for embroidering those flowers. Page 3 of the color card includes an interesting Announcement about Corticelli threads produced for Mountmellick embroidery. The rest of the announcement is a combination history lesson and advertisement. On the right side of the page, you’ll find a window housing real thread samples of the 13 threads produced by Corticelli. Each thread is numbered, and below, you can find the type of thread and an explanation of the colors it was or was not available in. To. Die. For! Wouldn’t you love to have thread cards like this, for your favorite threads? Weights, twists, etc., all visible, in real thread – and then, on the next page, all the colors, in real threads? On pages 4 and 5, you’ll find the real thread samples in all the colors available. Certain symbols or letters next to colors indicate which types of threads (shown on page 3) are available in that particular color. Feel free to click on the photos for larger versions. You can see, in the lower right, that they even had a small line of variegated threads. 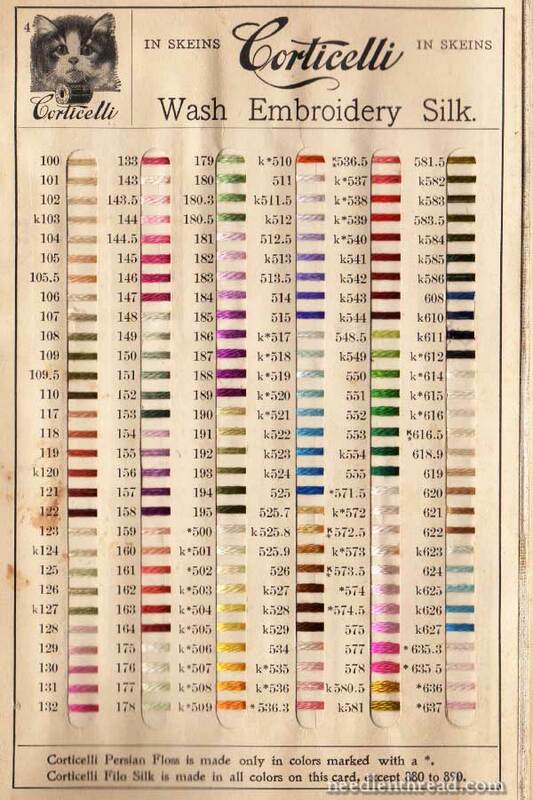 Even though the color card is about 100 years old, the silk is still vibrant. …including their silk made for crochet and knitting. 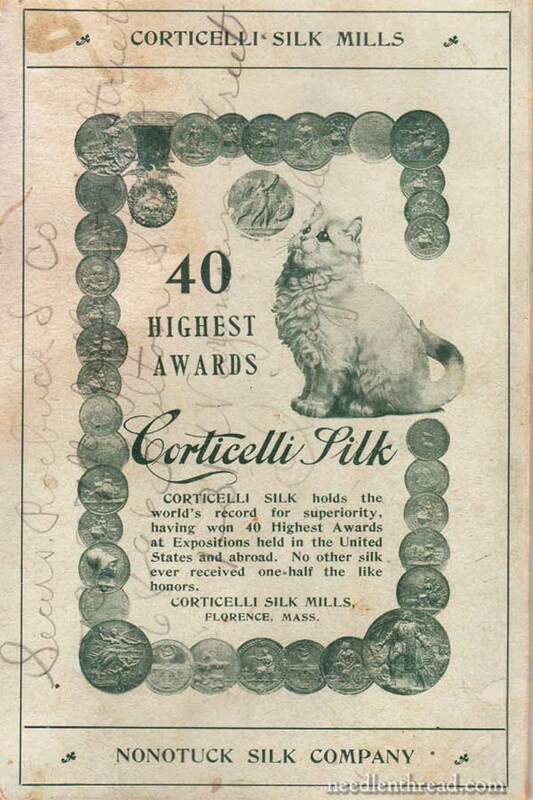 On the back cover, you’ll find some marketing material – Corticelli won top awards in the silk industry for their threads, over all other threads manufactured at the time, both home and abroad. And they wanted to make sure their customers knew it. And I love the fact that someone used this particular card to jot down the address of Sears, Roebuck & Co. in pencil. If the writer only new that about 100 years later, someone else would be treasuring this card, she might not have written on it. But I’m glad she did! 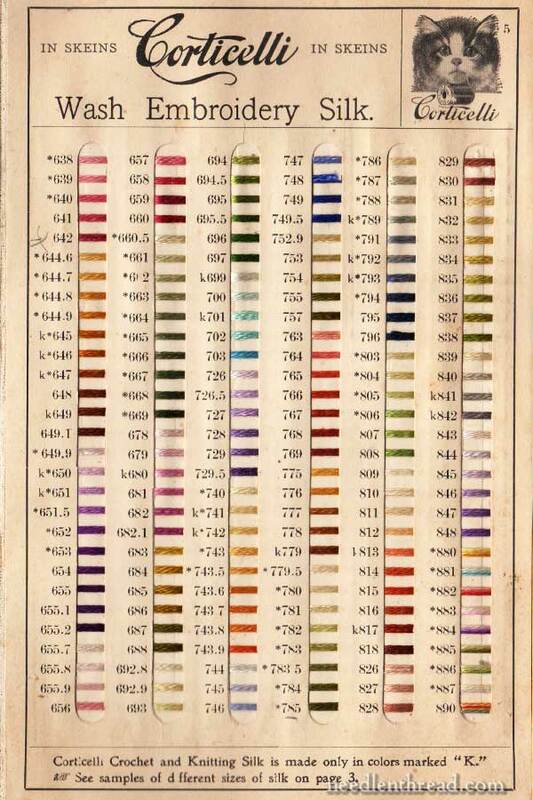 So, a little history of silk manufacturing in the US and a glimpse at the very handy real thread color card. If you’d like some further reading on the history of silk production, Silk: It’s Origin, Culture, and Manufacture is a nice little book available online. You might also enjoy browsing The Northampton Silk Project website, which chronicles the history of silk production in Northampton, Massachusetts, and the surrounding area. The Northampton Silk Route (PDF) is especially interesting. A really interesting article on the history of Corticelli silk thread, I would have liked to see the threads and try them. Silk thread cards are so useful when you are starting a project because you actually have the thread colours and the nos in front of you and can choose the right colours which makes it easier for ordering threads, I have difficulty choosing thread when ordering online because you can’t really see the colours. I would love to have a the Soie D’Algar silk thread card which used to be available here in the UK but sadly not any more. 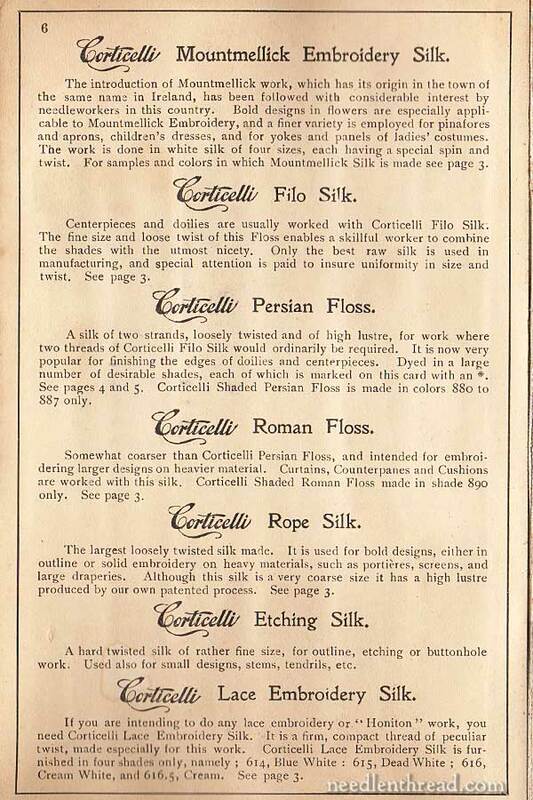 Thanks for sharing with us the history of Corticelli silk thread, it’s a shame they have gone out of business. Sample cards like this could be a good resource for color matching old product lines to existing brands. I’m fond of some of the old Heminway publications (you can find them at the Antique Pattern Library) that lay out projects and recommend certain colors. Oh! How absolutely wonderful that you, of all people, have this card. Who else would share it with so many of us? So many things like this just get tossed in the trash when estates are liquidated. Makes me realize that I need to add my sample cards to the list of things to tell the kids they need to sell or donate wisely, not just pitch. More sources of information about silk (my favorite fiber): “The Story Of Silk” by Dr. John Feltwell is a very scholarly work. It’s out of print, but still available: http://www.amazon.com/The-Story-Silk-John-Feltwell/dp/0312057725. Somewhere I also have the 1984 issue of National Geographic by photographer Cary Wolinsky, entitled “Silk, The Queen of Textiles.” That will be in a garage or rummage sale somewhere, but worth hunting for as the pictures are lovely. Right now I am drooling over a recent eBay purchase: nearly 40 skeins of Pearsall’s Mallard Floss silk, all different colours. (Old, of course, but in very good condition.) Think of the fun I can have using those! Question — If all the various places closed by the 30’s, who was making the ‘Belding-Corticelli’ silk button-hole twist we used to buy on those short spools? I remember when THEY went out of business sometime in the 80’s — when you could get the spools for $.15 on “clearance”. I still have my treasured basket full of them. I wonder if it opened up again after the war, or if it was resurrected by a buyer, and started over. I’m still reading up on Corticelli, still, but I’m finding little beyond the 1930’s. To tell the truth, I got all excited thinking you’d found a brand new silk thread supplier! I’m slightly disappointed… Still, with all the sources and brands out there, I STILL can’t choose what to try first. This is really interesting. I know that you have cautioned against using vintage cotton threads in at least one previous post. I have quite a nice collection of Corticelli and other silk threads, inherited from my great-grandmother. Should I continue to enjoy them for their colour and shine in their packaging or is it possible to actually stitch with them? Sure! Test them first, but silk has a pretty long life! Thank you, Mary for this informative posting. I will print out some of those pages to keep in my library. It’s nice to know the history of those vintage treasures that many of us collect. I appreciate your article. Dear Mary, looks like you’ve found a wonderful piece of history. Those silk pieces are still vibrant and I was amazed to spot old style variegated threads – not like the 20cm of one colour and 20cm of another we get today as variegated. How lucky those embroiderers were. How wonderful to see that they had silk Mountmellick threads! I can imagine how soft and glossy they would have been made up. I’d love to see a piece of Mountmellick made with them. They are so uber luxurious and I could see many other uses for them today. Delightful post Mary, I’ve been wondering about the Corticelli company for a long time but never took the time to research them properly! This is so cool! And exactly the kind of post I wanted to read today. Wouldn’t it have been something to have a peek inside the Expositions in the US and Abroad where these silks won those 40 Highest Awards? My imagination is running wild at the thought of it. I am amazed that all of the threads are still intact and so beautiful. How are they attached to the card? I am also dying to learn how this treasure came into your possession! Thank you for sharing this with us. The history was very interesting and yes I do wish companies would put out a colour card the same as this one. That would be just so helpful in planning projects and make purchasing the chosen threads so much quicker and easier. As to making my own colour thead card, well no, I haven’t thought about it but nevertheless it is a good idea. Perhaps a ring A4 folder (or similar) could be used with the DMC Stitchbow Floss Holders/Binder Inserts. Granted it’s more cumbersome and far more bulky than the stitch card above, but is along similar lines. What a shame the threads are now extinct! I guess cotton is way cheaper and easier to produce these days than silk. Maybe the 2 world wars had something to do with their demise too. Thanks for this interesting piece on Corticelli. I remember when I was young seeing Belding Corticelle silk sewing thread and silk buttonhole twist, of course on real wooden spools. I’m older than I’d like but was not around in the early 1930’s when you say Corticelli and Belding-Heminway went out of business. Were these product names pick up by another manufacturer? I didn’t know Corticelli made embroidery thread but have seen skeins marked Filo Silk. Was this only their product name or is it a type of thread like say “floss”? The first thing I noticed was the 12 cents. LOL You can’t even buy a gum ball for that amount. Yet here you were able to buy a color card with silk samples included. What a deal. In answer to your question: “Wouldn’t you love to have thread cards like this…?” Of course and absolutely. I know there are DMC cards that cost considerably more than 12 cents. But to have not just colors but weights and types of threads – that would be a dream. I have had the pleasure of working first hand with many of these silks from many of these manufacturers at a Monastery that closed their art needlework department years ago. We have been cataloging a the collection of silk threads and it had been an exciting and fun project to touch, feel and handle these treasures of old. When all was said and done, there were of 70,000 skeins of floss that were identified, counted and cataloged. Thank you for the article and resources! In working with these silks from different manufacturers, it was amazing to note what a wonderful job they did with providing shade variations. Popular colors would have 8 to 10 or more shade variations from light to dark. There would be 1/2 colors and some times an A, B, and C variation of the same number, sometimes with differences that were so minor one had to look very closely, and then the difference were noticeable. There were not large transitions in the color shades either. I have yet to see a modern day line of silk floss that offers shading variations from light to dark like the silk flosses of old. Fascinating, Mary. Thanks for sharing that. I’m considering buying the DMC Real floss color card. Do you have it? Is the quality nice? I can’t find any reviews of it, so I’m not sure if it’s worth it, but seeing the images above, oh, how I’d love to have a complete DMC floss card to drool over. 🙂 Link below to the DMC card that they have on their website. I have two versions of the DMC card with threads, W100C (copyright 2000) and W100TC (copyright 2002). The threads are organized by color families, and also has a table organized by color number listing the column where the sample is. If you want to change up colors, it’s a good resource – I’d give it at least 4 stars in a scale of 5. The cardboard has held up well with moderate use. I probably bought mine at AC Moore, with a 40% or 50% off coupon. Didn’t know they even made these with threads any more – just photos. I’m always interested to learn about threads. There’s an active ebay listing by Fireside Stichery of some Corticelli threads, ending Jan 16 (2015). Mary what a great treasure you have! I love this post!Thanks for the historical information. I have a Nonotuck Silk Co. Corticelli Standard Colors thread sample that may interest you. I am going to list it on my etsy shop, Bingville soon but would love your input before I do! Thanks! I have photos andam happy to share them if you would like. It is s folding sample booklet with five sections. The card is covered in fabric and has lovely gold company info on the front. I have 21 skeins of Belding Heminway Corticelli Silknit sport yarn. I was thrilled to find your article to learn about the history of this silk. Thank you! I’ve found this post really interesting. I’ve been wondering about silk thread production in the US/North America and am particularly curious about the intricacies of wooden spool production by Corticelli, Belding-Corticelli etc, and why it appears to have been mainly North American silk thread producers that went in for embossed wooden spools rather than ones with gummed paper labels. I don’t suppose that you can offer any insight on this? My latest blog post ponders the question – with images of some old thread spools from my own collection. If you have a moment, please take a look. Thank you. Thank you for the interesting read! I was recently asked about some Corticelli Silk thread, and came upon this essay. I love all things silk, and am a busy crocheter. Thanks again. My great grandfather, Louis Blanc, worked for Corticelli in Massachusetts and also in New London, CT. He was a silk dyer and was known as one of the best. I would love to get ahold of some of the old silks he may have had a hand in making! I’ve been using a wonderful smooth black thread to repair silk scarves and as I’m running out, I looked it up on the Internet to see where I can get some more. Had I known I was using a super vintage silk thread I would have used it only on special projects! I have a wooden spool of 50 yards of black silk thread labelled Corticelli, made in Canada, with a capital letter A. Of course, now I have less than 50 yards, but I’m fascinated to know if it indeed dates back to the 1920s and also, whatever happened to the Canadian production? Your article only mentions the American side of production. I’d appreciate any info you may have as I will now cherish what remains of my spool. Our library (Ohio University) has some Corticelli silk cards in its special collections. 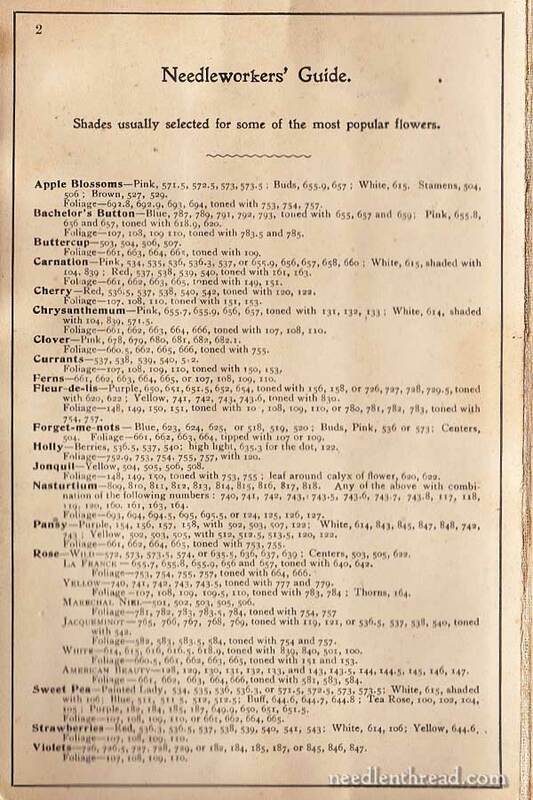 https://media.library.ohio.edu/digital/collection/p15808coll9/id/33 lists the many kinds of silk threads they created. These are part of a larger collection of needlework examples and promotional materials of Barnett Hook, a Southern Ohio man who sold Corticelli silks and beautiful needlework in the early 1900’s. More about him here: https://media.library.ohio.edu/digital/collection/p15808coll9, including many high-res images of the 27 items of his needlework we hold here at Ohio University Libraries. Could you tell me the diameters of the threads and Corticelli’s nomenclature? Hi, researching Corticelli Silk, due to a cabinet I’ve purchased. Their name is inside. Would love to know more about it and its age. Please send me an email so I can attach picture if your able to advise me. Thank you!! Next Next post: Exquisitely Fine Detailed Embroidery – Can You Guess?